A total of 16 teachers from different countries are together in Aveiro participating in the European training course on tangible programming, promoted in the framework of the TangIn project, by Universidade de Aveiro. Started on last Tuesday, the first edition of this European teacher training course on tangible programming is running the third day. On the first day, two sessions with experts in ICT for education, tangible programming and computational thinking were promoted. An initial session with professor António Silva was oriented to virtual reality and its use in education. In the afternoon, a workshop on the fundamentals of coding and programming was lead by Professors Rui Gonçalo Espadeiro and Raquel Costa. The second day was dedicated to more practical-oriented activities and teachers were invited to visit the Monte primary school (Murtosa schools cluster). 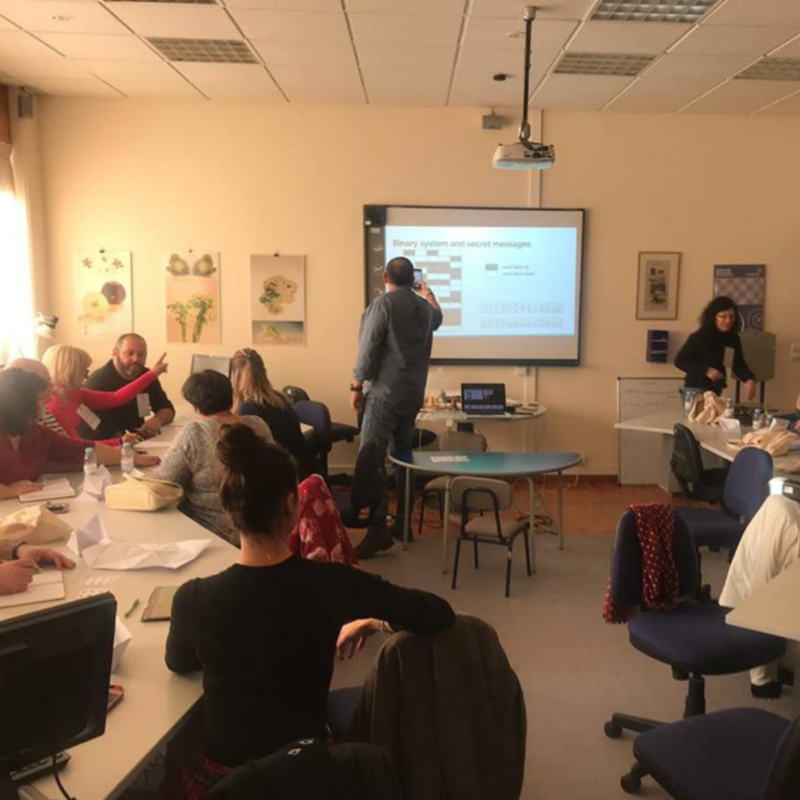 During this day teachers have observed how Portuguese peers have pre-piloted in their classes some of the educational resources developed under the TangIn project, using a robot and blocks for tangible programming. The European training course includes three more sessions and will end next Saturday. Participants will now focus on the practical aspects of tangible programming, namely the use of robots, programming with blocks, basic programming concepts, etc. After, they will be introduced to the TangIn toolbox for teachers, composed of lesson plans with exercises for tangible programming, covering STEM-based topics, and a teachers’ handbook. These sessions will have also hands-on activities where teachers will play as they were their students, learning to programme with the support of a robot and blocks. At the end of the European training course, teachers will be prepared and empowered to use the toolbox in their classes, promoting students interest and motivation towards tangible programming and STEM-based subjects, while increasing the inclusion opportunities of disadvantaged learners. To learn more about the TangIn project or if you would like to know how to participate in the project activities or have access to the resources produced, you can do so by contacting Pedro Costa through the email pedro.costa@inova.business or by consulting the project website (www.tangin.eu) or the Facebook page (https://www.facebook.com/tanginproject).